The adult is a guide, a relay between the pedagogical materials and the child. He presents to the child slowly, one by one, the items of the pedagogical materials adapted to the needs of each child. Then the adult leaves and allows the child to experiment at his own pace. 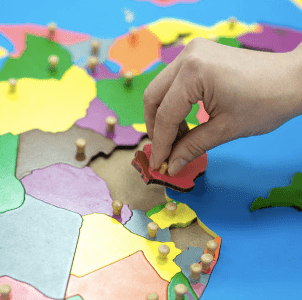 The role of the Montessori educator lies in observing the needs of each child, in presenting the material that will awaken his curiosity, in maintaining a favorable atmosphere for concentration. Each item of the teaching material presented to the child has only one difficulty at a time. It has been carefully developed by Maria Montessori and remains current today. It is based on scientific data and gives the child the means to develop mastery of his gestures and to approach abstract notions by experimenting with them, making them concrete. Teaching materials contain the control of the error that will allow the child to adjust gradually without being judged, for good or for bad. The environment prepared by the adult allows the normal development of the child towards autonomy. Quiet environment, shelves within the reach of the children who could choose their material, keeps it as long as necessary and bring it back to its place so that it can be available for another child. Rules that allow children to develop individually in the group:respect for self, others, material. The child chooses his work among the materials presented to him, moves freely, speaks without disturbing his neighbors. No marks, no punishments, no rewards (so that the child does not work for a reward and the joy that his work gives him is the reward he gives himself). There is only one copy of each material so that children do not compete in their work. 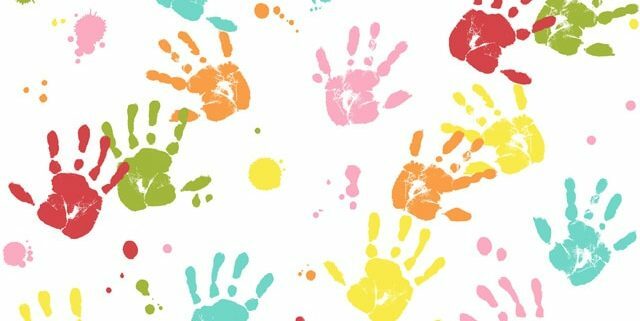 The time required for each to integrate, to experiment, varies from one child to another, from one moment to another, from one material to another. Everyone has the time to understand, to deepen, to incorporate knowledge at their own pace. The program, which the child chooses, corresponds to his needs. Each stage of the teaching material prepares the next one and allows everyone to progress on a daily basis. 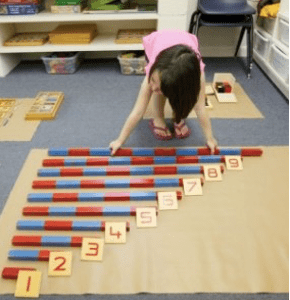 Maria Montessori observed in the child sensitive periods, key periods when the child is absorbed by a specific element of his environment (the sensitive period of order, movement, social sense, language …). The material designed by Maria Montessori allows the child to meet his needs during these sensitive periods. These activities are the first ones that are presented to the child when he arrives at school. 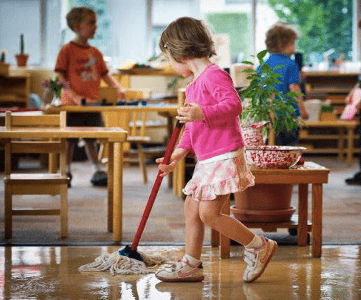 They are activities related to the simple gestures of everyday life (washing hands, dressing, sponging, handling common utensils, transferring liquids, etc.). They aim to develop fine motor skills and eye-hand coordination. 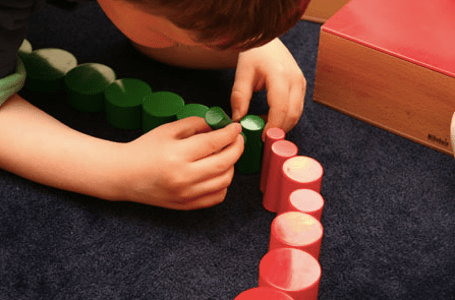 Indirectly, the child structures his thoughts by experiencing a complete cycle of work (from the free choice of activity to putting it back on the shelves). The child constructs his intelligence by developing his sensory capacity to organize the information present in his environment. The sensory material helps the child to refine his capacity for sensory discrimination (weight, size, shape, color, etc.) and to develop his mathematical mind (comparing, grading, ordering), indirect preparation for geometry and arithmetic. This material, which requires careful manipulation and develops the forceps, is an indirect preparation for the gesture of writing. These materials, although introducing complex abstractions (numeration, function of operations), are also sensory materials. The introduced mathematical concepts (addition, subtraction, multiplication, division) are materialized to allow a concrete understanding. 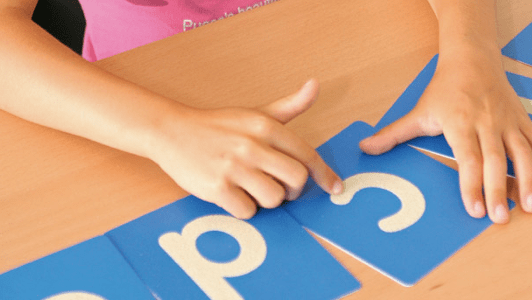 Language materials, oral at first and then written, develop vocabulary, writing and then reading to finish around 5 ½ years by a grammar approach in a sensory way. These allow the child to become aware of the world around him.